I grew up in Hawaii where sushi in my family usually meant something like a California roll. We ate sashimi as well, but I'd not had nigiri, or at least really good nigiri, until coming to San Jose. Our friends introduced us to some awesome sushi at Sushi Masa in south San Jose, and we were ruined forever. Now, Annie and I are very discriminating sushi lovers. 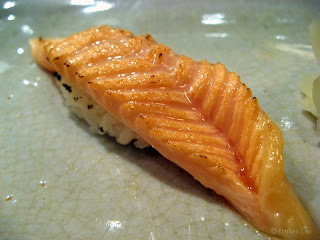 Searching around on the Internet, I found out about Akane Sushi restaurant on the "Big List of Peninsula Sushi" http://www.emeraldlake.com/sushilist.html . It was #2 on the list because of the high quality fish at a great value. So when the opportunity arose, I suggested we head out to Los Altos and see for ourselves. Even though we were enticed and sidetracked to the Los Altos farmer's market, even though we grazed at said market for a whole hour after arriving, and even though we actually picked up a rotisserie chicken from the Roli Roti truck, we still made it to the restaurant. The place was packed but there was room at the sushi bar for us to sit down. We told the itamae, Shu-san, "omakase" or chef's choice. Instead of ordering from a set menu, it's up to the chef to choose for us. First up, Tai, or snapper. 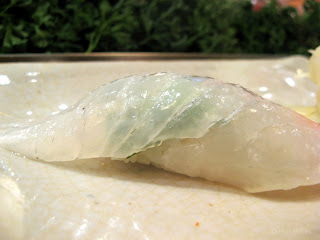 There is a small piece of shiso leaf tucked between the rice and the fish. Then the fish is drizzled with lemon juice and sprinkled with sea salt. Exquisite. Next up: Hirame, or halibut. The fish is lightly seasoned with a soy-ponzu sauce. Very nice. Third came sake or salmon. This wasn't just a cold piece of fish slapped on some rice. I noticed the chef got out a small blowtorch to scorch the fish. This seemed to melt a little of the fat and activate the oils, while also giving a smoky overtone. Amazing. 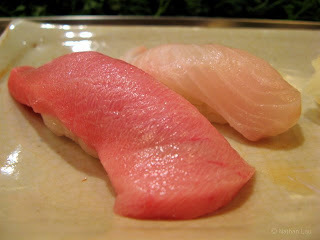 Nigiri #4 and 5 were toro (fatty tuna) and kanpachi or jackfish. The toro was excellent - melt-in-your-mouth delicious. 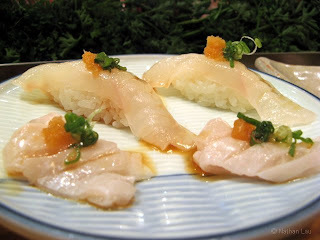 The kanpachi was firm and sweet, but not particularly noteworthy. OMG. I am SO HUNGRY for real sushi. I can't get good fish here!